President Donald Trump on Monday will release his first National Security Strategy, a congressionally mandated document designed to guide the administration's foreign policy. White House national security adviser H.R. 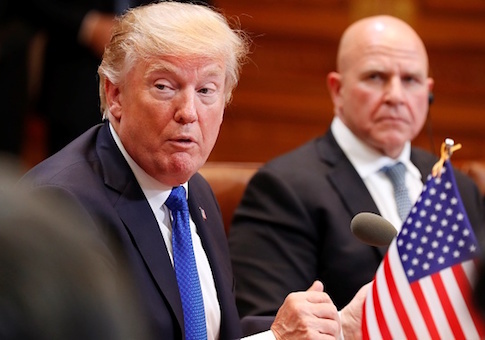 McMaster said Tuesday the outline will focus on protecting the U.S. homeland, advancing American prosperity, "preserving peace through strength," and expanding American influence. Appearing for the first time with his British counterpart, Mark Sedwill, at an event hosted by the London-based think tank Policy Exchange, McMaster said the strategy will ensure U.S. political, military, financial, and cultural ties "are as strong as ever." He said the doctrine will seek to corral U.S. allies and partners to confront shared threats, including "revisionist powers," such as Russia and China, rogue regimes, such as North Korea and Iran, and non-state terrorist groups, such as the Islamic State. "We have to work together harder than ever to ensure that nations uphold the rule of law, respect the sovereignty of their neighbors, and support the post-World War II, post-Cold War order of peace, stability, and collective security," he said. McMaster said the security blueprint will focus heavily on "competitive engagement" to counter "economic aggression" from China and the unconventional tools of warfare deployed by Russia. Alluding to the Kremlin's attempts to infiltrate domestic political systems across the world, he said Trump's new strategy will confront the challenge of Russia's so-called "new generation warfare." "These are very sophisticated campaigns of subversion, disinformation, and propaganda using cyber tools, operating across multiple domains that attempt to divide our communities within our nations and pit them against each other and try to create crises of confidence," McMaster said. The strategy previewed by McMaster reportedly received Trump's backing last week. This entry was posted in National Security and tagged Donald Trump, H.R. McMaster. Bookmark the permalink.